Well, this past year, I didn’t get a chance to update the last two weeks. Which included both the PIAA and UIL finals in Week 17 and 18. Although much didn’t change from my last trips to these events. Going into Week 17, I had witnessed 87 games. After the four PIAA finals, I wa at 91 heading into the final week of the season in the country. Only nine games remained. All of them taking place in Arlington, Texas. So, it was with this, that I drove to Texas for the weekend to take in three days of football that is just staggering in scale. With the finish of the Allen-Houston Lamar game, the 2012 High school Football season came to a close. And, as I did last year, I want to recap the season and give my opinions on things. In total, I’ve seen exactly 100 different high school football games in 2012. Unlike in years past, I only saw games in only six different states. I also saw games over all 19 weeks of the season. Starting with Week 0 in Kentucky and closing with Week 18 in Texas. I’ve seen games in 48 different venues. And, I’ve seen a total of 165 different teams play in 2012. In games I’ve attended, there were 4,995 total points scored for an average of 49.95 points per game (1.995/game more than last year). The average score was 34.5-15.4. In total, there were 7 shutouts, and the most points scored was 66, with only four teams scoring over 60. There were 8 overtime games, of which two went to double overtime. Two games were called final early, both due to weather. Most games seen in one weekend was 10 in Week 1. And 9 in Week 18. Fewest was 3 in Weeks 11, 12, and 13. I saw 25 state championship games and 14 other playoff games. Saw 148 different teams once. Saw Steubenville (OH) ten times. Saw Richmond Edison (OH) five times. Saw Greenville (PA) four times. Saw Aliquippa (PA), Bowerston Conotton Valley (OH), Burgettstown (PA), Clairton (PA) and Hermitage Hickory (PA) thrice. Saw Beaver Falls (PA), Bellaire St. John Central (OH), New Castle Shenango (PA), New Wilmington Wilmington (PA), Pittsburgh Westinghouse (PA), Sharpsville (PA), St. Clairsville (OH), Steubenville Catholic Central (OH), and Wexford North Allegheny (PA) twice each. *-Honorable mention: Wilmington v. Greenville tied 0-0 through regulation, 10-9 after 2OT. As I did for the last two seasons, this is my opinion on the quality of teams, fan support, state organization, etc for the states I’ve seen games in. Once again, Texas wins. Ohio was a close second, but it’s pretty obvious. Texas is hands-down the biggest, most ardent fans of high school football. Approximately 50,000 in attendance for the Allen-Houston Lamar game trumps any argument that can be made for any other state. Ohio supports all levels well. West Virginia really dropped, for me. Morgantown and Oak Glen just had little in way of attendance for the games I attended to what I felt they should be. New Jersey was a surprise. Despite them not having state-wide playoffs, these games at MetLife Stadium had rather large crowds with fans who really cared about the outcomes. Pennsylvania actually seems to have gotten better, especially for the playoffs. Ohio is Ohio. Pretty solid support both for their city schools, and the small towns. Both big and small. Private or public. And Kentucky is being judged by two ‘bowl games’, but the ones hosted at a home team’s stadium just was poorly attended. And the one at Eastern Kentucky University wasn’t much better, though the stadium was a great choice. Last year, I had Texas slightly behind Ohio. Just barely. But, just judging by the state championship games only (for TX, OH, PA, and NJ), Texas is a slight favorite. Especially the further up the ladder you go. Pennsylvania did quite well again. Good teams all around, but is weighted by some behemoths (Clairton, North Allegheny, and Aliquippa) that are generally just so dominant compared to the rest of or most of their level. New Jersey is quite high at the top end. But, even some of the smaller schools would hold up well against the average playoff bound PIAA team or OHSAA team. Kentucky is being judged against relatively placed Ohio schools, and they’re definitely behind them, but are decent enough. And, West Virginia just disappoints again. For a state that loves football, the quality of their play at the HS level is just unacceptable. Ohio’s finals were a bit of a disappoint this year, so Texas and their massive crowds, beautiful weather, and just was a blast. Despite Ohio feeling a bit below the standard, the six games were still above everything else. The reentry policy at Cowboys Stadium made it nice. Had water and whatnot in my car, and also could walk to the Walmart between games to avoid overpriced stadium food. Although the CHILL brand ice cups are great. A huge surprise to me was the NJSIAA titles at MetLife Stadium. Completely blew me away with exactly how well HS football works in New Jersey. Even with rain on the first day for the Friday doubleheader, it was definitely worth the drive and greatly improved my opinion on the garden state. Again, the Crosstown Showdown is a mixed bag. I really enjoyed the four games at Welcome Stadium, even if it did feel like I was sitting on the surface of the sun for most of the game. Lack of anything nearby made it a bit of a drag, but being able to leave for the car was a nice relaxation and keep a case of water there. The games at Nippert Stadium were fun, but nothing overtly special. The doubleheader on Thursday at Colerain were a bit of a downer. Would’ve helped if the home team had played as well. Intermixed with my Crosstown Showdown games, was a quick drive to north of Columbus for a business issue, and then back to Steubenville for the Friday afternoon doubleheader for the OVAC Kickoff. This event is really nothing more than a double-header. Nothing more special than that. The PIAA Finals were much improved if only because attendance was improved from my last visit two years earlier. Matchups weren’t much to brag about, however. The WPIAL finals had the same issues as previously. Lack of reentry made this event tough, as always. Any food or drink is going to add a lot of cost. Primanti Bros. and Quaker Steak wings made it worth while, however. The last two were the Kentucky Bowl Games to start the season in week zero. Neither one of them really wowed me. One good game amongst the four. Crowds were average. The high school game’s redeeming characteristic was the sun finally set and stopped blinding you sitting in the home stands. These were the best ten. I had 20 I had listed, but realized that was just too many. These games aren’t just because the quality of the play on the field or the events in the game. But, including atmosphere, stadium, experience, etc. First game on the list was a Thursday night game in Western Pennsylvania. A missed two-point conversion ends the game in overtime. A lightning delay, despite otherwise good weather, delayed this one a bit. The next game was a horrible weather game. Moments before kickoff, a tremendous downpour absolutely soaked anyone brave enough to come out for this Saturday night rivalry game between Beaver and Beaver Falls. The wind managed to destroy my umbrella in the process, and I generally was soaked through and through. It was, however, a great game once the weather passed early on. The next three games had my team prevailing in rather exciting fashion. Steubenville held on the last drive up only six to hang on to win at Morgantown. The stadium and surroundings were just awesome. The school actually sits around the field in a V formation. The next game in the list was Greenville’s annual rivalry with rural Reynolds, who share the Greenville mailing address. Reynolds held the lead 20-6 after three, but Greenville stormed back to tie it late and send it to overtime. Reynolds scored a touchdown and failed to convert the run. Greenville then scored and the kick was good to win in thrilling fashion. The next game was a PIAA District 10 AA Quarterfinal between Greenville and Corry. Now, as I’ve said before, the PIAA has 12 autonomous districts. Each district has their own setup. In District 10, 1A and 2A have eight teams qualify for the playoffs. The top four in each of their two regions. Greenville, via that thrilling win over Reynolds secured the 4th seed in Region 3, which eliminated Reynolds. So, that put them up against Region 4 #1, Corry Beavers. Region 3 is basically Mercer County, and Mercer County had a very good first round. 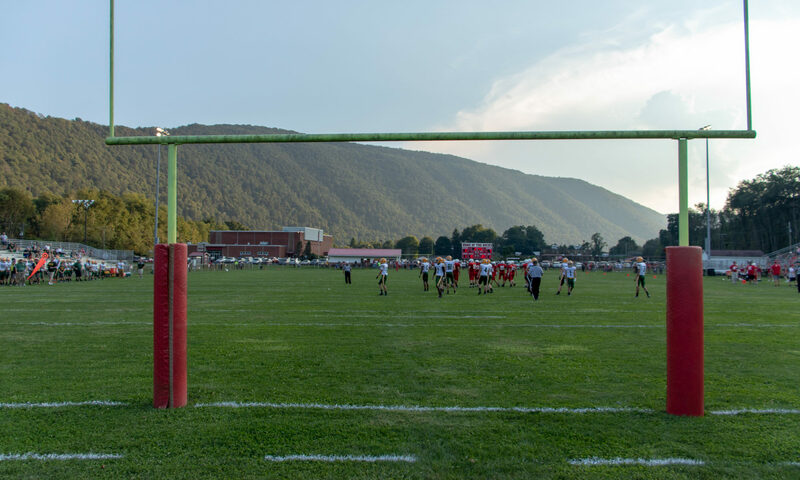 The toughest game was Greenville, who took on Corry at General McLane’s Linden Field in Edinboro, PA. Corry opened up an easy 14-0 lead after the first quarter. Greenville scored on a hook-n-lateral with 22 seconds left in the half. An onside kick and a few suddenly effective plays tied it at 14-14 at the half. It was then trading scores as Greenville scored and Corry matched it. Until 35-28 late in the game, and Corry fumbled away the game. All four Region 3 teams won their cross-over matchups with Region 4. Which sets up a game the next weekend. Greenville was set to play #1 Wilmington at Slippery Rock University’s Mihalik-Thompson Stadium. One of the best games I’d seen in years. Greenville played David and stimied every chance Wilmington had. Yet, Wilmington was just too much and Greenville couldn’t move the ball. The score was 0-0 through regulation. A first for me. In overtime, Greenville scored a field goal, and then Wilmington tied it. In the second overtime, Wilmington broke through with a touchdown to make it 10-3. Greenville scored, and had lined up for the PAT. The slick surface did not cooperate and the kick was badly missed. Wilmington 10, Greenville 9 in 2OT. The other game that weekend that ranks up here was the Lakeview vs. Sharpsville game at Grove City HS’s Forker Field. Sharpsville has been a juggernaut in PIAA D10 A, and they were getting everything they could from Lakeview. The Sailors continuously had a lead, but Sharpsville was able to score at will when they really set out to score. Lakeview was up 28-19 in the 3rd, but Sharpsville claimed the lead in the 4th. 41-34, but Lakeview still had one last chance after turning away the game. To be done in by another fumble on the last play. The Coldwater-Kirtland game was just a great game. A resilient Coldwater squad that never took no for an answer. In a state championship game. Was just a great game and atmosphere. The last two are out-of-state. 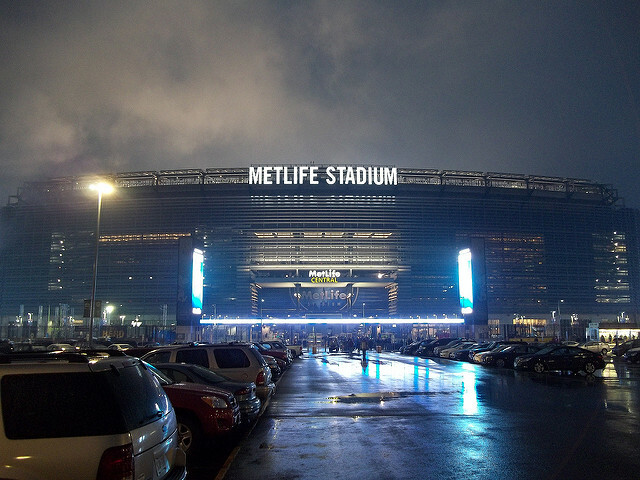 Local rivals Montclair and Bloomfield played a championship against eachother at MetLife Stadium. Underdog Bloomfield did what they could, but Montclair tied it and sent it to overtime. The game slipped away, and Bloomfield just couldn’t score. Montclair won in 2OT. And the last game on the list wasn’t the best game, but the atmosphere could not be beat. 50,000 at Jerry World. Allen, one of the biggest high schools, anywhere. Huge band, team, fan base, and all the trappings. Houston Lamar, the city school working hard to win, but Allen wasn’t about to be denied. These games were the most uninteresting games I’ve seen. The Mt. Healthy-North College Hill game just had no excitement at all. Almost any Burgettstown (PA) game could make this list. The first was the Steel Valley matchup I saw. Burgettstown was getting brutally assaulted by the JV squad and still couldn’t punch one across the line. The SCC-Barnesville game was just bad. I could’ve added the Conotton Valley-Catholic Central game, but at least that one had the weather issues and the game being called after three quarters to make it interesting. I enjoyed seeing Oak Glen’s new stadium (of which I still don’t know if it has a name better than what the sign said), but the afternoon game with heavy rain and an opponent that was way too much for them just made the afternoon drenching and boring. Indian Creek decimated Edison on a Saturday night affair. And the Summit-Palisades Park game just never had any punch. Was the least interesting of the weekend. The top of the list is pretty accurate. Allen by far was the best team I saw. North Allegheny really destroyed their competition, especially in the final. Moeller was good, but not #1. As for the bottom of the list, Woodward was probably better than Mathews, but considering the game I saw was Mathews vs. Lutheran East, the result could be distorted. East Liverpool really had to pull up on Woodward to avoid naming the score. Two years ago I saw 56 games in one year and was amazed how that was possible. Last year, I saw 73 and thought though it was possible, I wouldn’t be able to see 100. That was my goal. Expecting to fall well short of that goal, I set out and was surprised at the end of the year to not realize that Texas was playing their title games one week after PA, CA, and FL. This Week 18 setup allowed me to hit my goal of 100 games in one season. For the season, I averaged 5.2 games per week. I could set a goal this year. But, I think I’ll relax a bit. I will try to make the Texas games again. And if possible, either the Michigan finals or the trip to Minneapolis again. Something I’ve wanted to do for the past two years. I’m already working on the feasibility based on the schedule as it comes out. Root Sports will be airing Thursday games again, which means the ability to see four games a week plus the weeks with the multi-game events. In the past three years, I’ve seen 229 high school football games in person. Whatever I run that number up to in 2013, I know it will be a blast.